Relaxing At The Beach [C6894] - $13.00 : Yarn Tree, Your wholesale source for cross stitch supplies. A cross stitch pattern by Blackberry Lane Designs. Now this is the way to relax at the beach! Hook up the camper & park it in the sand! The camper is decorated for summer with a banner & flamingos out front. Seagulls are flying overhead. 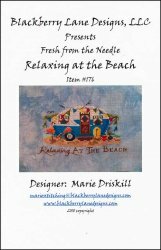 "Relaxing At The Beach," is stitched at the bottom of the camper. Stitch count 83w x 42h.